SeaTrek Sailing Adventures, an inbound operator with headquarters in Bali, Indonesia, reached out to GLP Films to help increase their travel trade presence, boost their partnerships and ultimately increase sales. SeaTrek knows they have an incredible list of experiences to offer in Eastern Indonesia, but the word isn’t out to the rest of the travel trade industry. They wanted to work with select partners that are aligned with their small ship cruise experience, sustainable travel ethics and authentic customized experiences in a remote location. We started with an 8-day adventure in the remote and other-worldly Raja Ampat archipelago to produce one short-film and 4 social videos. The short film featured Raja Ampat experiences through the eyes of local adventurer and SeaTrek boat captain, Dian Garaf. Social films highlighted adventure and cultural experiences offered by SeaTrek on their Raja Ampat small ship cruises. In order to boost SeaTrek’s product awareness in the travel trade industry, we worked with our global travel trade media partners to distribute our PR and video content. Targeted email campaigns went out to select travel industry professionals that best aligned with what SeaTrek wanted in an industry partner and ultimately their clients. Our travel trade microsite was the hub for partner information, inquiries and to share video content. In this 6-month campaign, we saw some incredible results from our strategic partnerships with the travel industry. Our strategic marketing campaign to select trade partner leads converted 41 new partnerships with agents and outbound operators. We gave 200 current agents and outbounds free access to new video content to share on their websites and social media. Combined with our own distribution strategy, travel trade reach was 490,000, with 44,000 impressions. 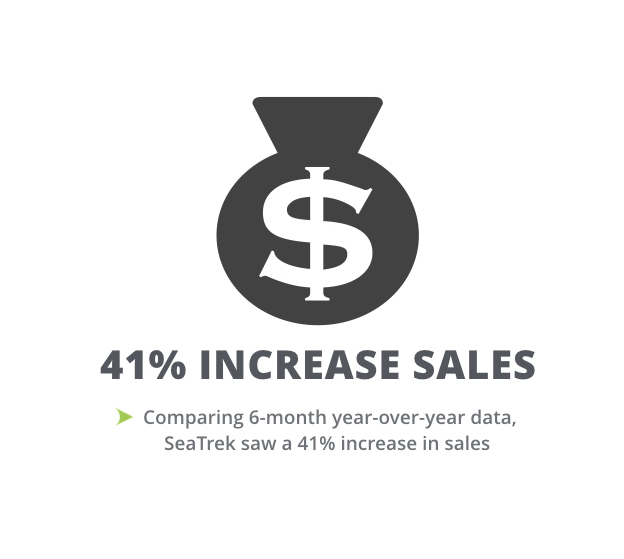 Year-over-year sales comparisons saw an incredible 41% increase in sales and 33% increase in customer inquiries. To top it off, we won the Travel Weekly Magellan Gold Award for Best Cruise Marketing Video!